Brew in a Bag (BIAB) is a quick, easy and economical way to brew all grain batches of beer. I released my brew day spreadsheet some time ago along with a version of that to be used for small batch beers. See below for links. Either of those could be modified to work with BIAB by changing variables, This version is specifically designed for full size BIAB batches. 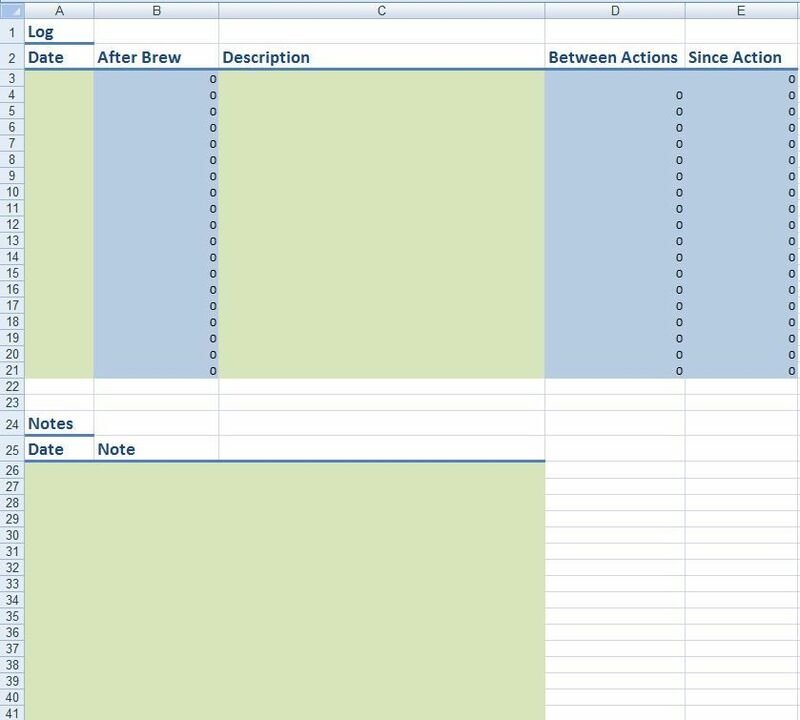 How do I use brew day spreadsheets? First, I do use recipe formulation software. Some of those programs have brew day components. I’ve just never gotten into using those features. For better or worse, I use a spreadsheet. I make a copy and name it using the batch number and beer name and then quickly plug in the basics. This creates a one sheet printable page that I can use on brew day. That gives me a single piece of paper with all of my numbers and a spot for brew day notes. Notes can go back into the spreadsheet for archival. General Layout and Flow: Start with Beer Name, Brew Date, Batch Number and 1:Beer Info. Fill in current grain temp under 2:Strike Water Temperature and step by step directions are populated under 3:BIAB Directions. Constants on the right hand can be set once for your setup and adjusted as needed. The bottom section of this sheet contains three calculators explained below. 1:Beer Info: Basic information about your beer and mash profile. “Reserve (gallons)” B12 Cell: Allows you to set aside a set number of gallons for sparge, dunking, topping off, etc. This is subtracted from the total strike water value. It is assumed that you will add or use this at some point. “Mash Volume – Can I mash it?”: This field estimates total mash volume including grain and water. This is an estimate. The cell turns red if the projected volume of your mash exceeds the size of your mash tun. This is an adaptation of the formula found on the Green Bay Rackers Calculators Page. 2:Strike Water Temp: Fill in the Beer Info section and your Grain’s current Temperature (cell B5) and the spreadsheet calculates your strike water temperature (cell B6). Note that the temperature will be offset by the “Undershoot Mash Temp” (cell H7). Read the constants section for more info on that. Strike Water Volume: Calculates the amount of water you will need in both quarts and gallons. Volume Needed – Start of Boil and 15 Minutes Remaining: These sections list required water volume at two important times. The 15 minute calculation attempts to take into account expansion of wort at boiling. Take a measurement at 15 minutes and use this figure to correct a low volume. A note on “Undershoot Mash Temp” – This cell allows you to come in under your desired mash temp. Why would you want to do that? It’s easier to ramp up a degree or two vs cool down a degree or two. This number is subtracted from the calculated Strike Water Temperature recommendation (cell B6). I suggest reviewing the Constants section to make adjustments for your setup. 3: BIAB Directions: These are narrative step-by-step directions that you can follow after you fill in Beer Info, Grain Temp and Constants. Note that you can use the table from the “Summary Tab” for on the go adjustments to the strike temp referenced in step 1. Calculators – The bottom three sections of this tab are calculators. These calculators can pull from cells in the top portion of the tab, but they do not affect 3:BIAB Directions. Efficiency: This calculation uses your recipe software’s efficiency setting for a particular recipe along with target gravity to figure efficiency. That means no re-entering fermentables for every batch. I figure efficiency when going from the mash tun to the boil kettle. This is a calculator in the sense that it is standalone and has no bearing on other calculations or cells. Anytime Gravity Estimate and Correction: Plug in volume, boil time and gravity figures at any time during your brew day and this calculator will suggest volume and gravity corrections. Accepts either gravity or Brix (if both are present the Brix value is used). If you are under volume, I would suggest correcting volume and then re-checking gravity. This calculator makes no attempt to correct volumes or gravities that are too high. 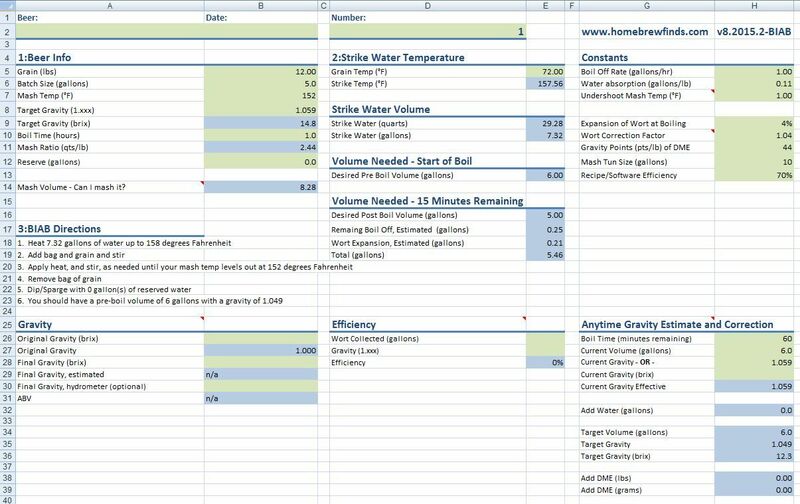 This is setup to print on a regular 8 1/2″ x 11″ sheet of paper and gives a rundown of essential brew day tasks and data. I use this print out on brew day. Prepare: This is a simple to do checklist. You can modify this section as you see fit based on your procedure. This entry was posted in All Grain, BIAB, Reviews & Top Posts, Spreadsheets, Tips, Top Posts on August 10, 2015 by admin. Do you do any water adjustments to account for pH? I have found the pH levels of my mash get high when doing BIAB. Hey Nick! I don’t always do that, but I certainly have. How do you usually figure water adjustments? I’ve used bru’n water spreadsheet in the past, with mixed results. Awesome. Would be great if this were available in metric as well. Nice job and thanks for sharing the spreadsheet. One question I have is about the water absorption constant. This is just for the grains, correct? I was wondering how you could incorporate absorption for hoppier brews, such as a Pliny the Elder clone or other double IPAs with massive amounts of hops? The absorption is just for the grain. It doesn’t take into account trub loss or hop absorption. Good additions for a v2. What is your typical efficiency for BIAB? Do you crush finer for BIAB? I ask because I did one BIAB a few months back and had a efficiency of about 65% based on my normal all grain set up and my normal crush. About 65% for me. I haven’t spent a lot of time trying to better that. Thank you. Just wanting to make sure 65% was reasonable.